Wednesday, May 14, 1947, Crosley Field, Cincinnati, Dodgers visiting the Reds, bottom of the 2nd inning with the locals up 1-0 and Reds’ All-Star SS Eddie Miller is picked off first after a leadoff walk, Jackie Robinson making the putout at first base after receiving the throw from the Dodgers’ lefty starting pitcher Joe Hatten, as umpire Babe Pinelli emphatically makes the call. 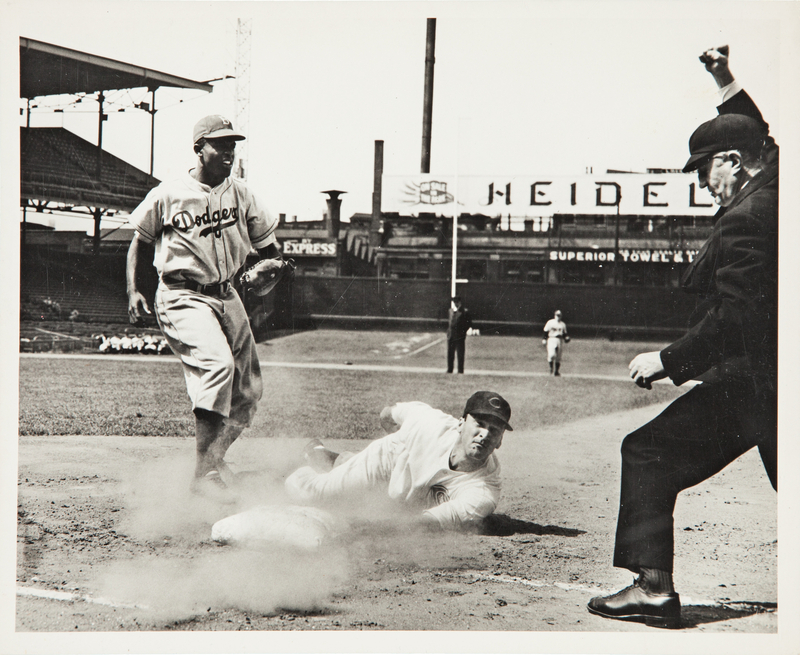 This exciting action photo was taken by Carl Wellinger of the Cincinnati Enquirer, who was undoubtedly poised just a few feet from the action beyond the foul line, in the days before camera wells and easily portable zoom lenses. 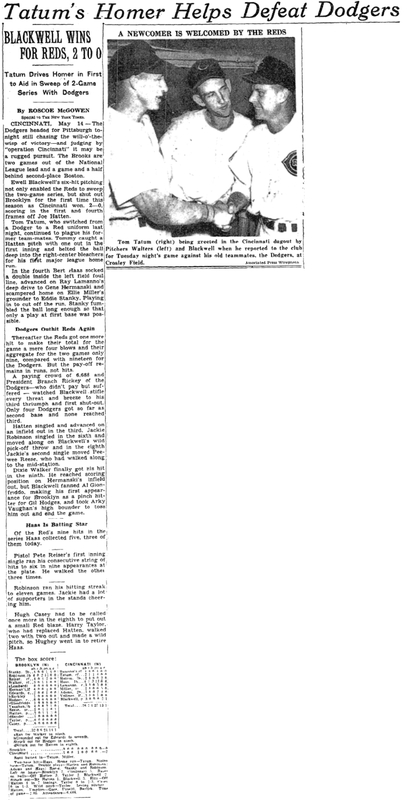 For Jackie Robinson, he was almost a month into the “great experiment” of breaking the Major League’s color barrier, but many hurdles lay ahead; he was playing in his 22nd MLB game this day, but only the second road trip of 1947, and the first away from the east coast. 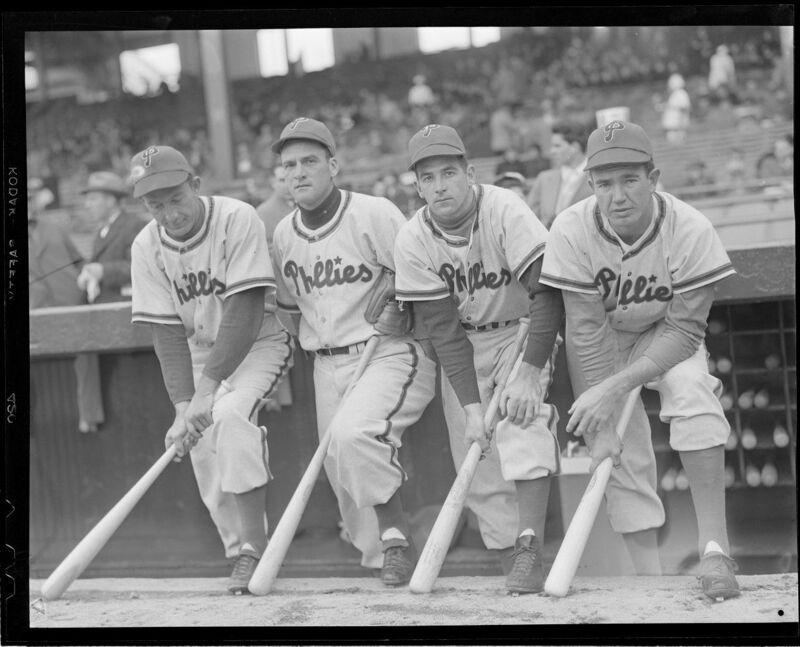 His first road trip was to Philadelphia, a few days prior, which presented some difficulties of its own; after the Phillies’ manager Ben Chapman demonstrably laid into Robinson on the field with vulgar racial epithets during their visit to Brooklyn in the second week of the season (as portrayed in the film “42”), public outcry and pressure from their front office necessitated a “peace offering” of sorts on the Dodgers’ first road trip to Philadelphia, culminating in an uncomfortable on-field photo shoot of Jackie and Chapman holding the same baseball bat to try to diffuse the situation (below). What may be lesser known is that during this trip, the gesture of “good will” did not extend very far beyond the playing field, as Robinson was not permitted to stay in the same hotel as his teammates during their visit to the City of Brotherly Love. Things would not go any easier during Jackie’s trip to Cincinnati – as Vin Scully later recalled, due to death threats, there were sharp shooters stationed atop Crosley Field, as well as on nearby buildings beyond the outfield fences, including the Superior Towel & Linen Service building beyond left field, seen in the first photo above. 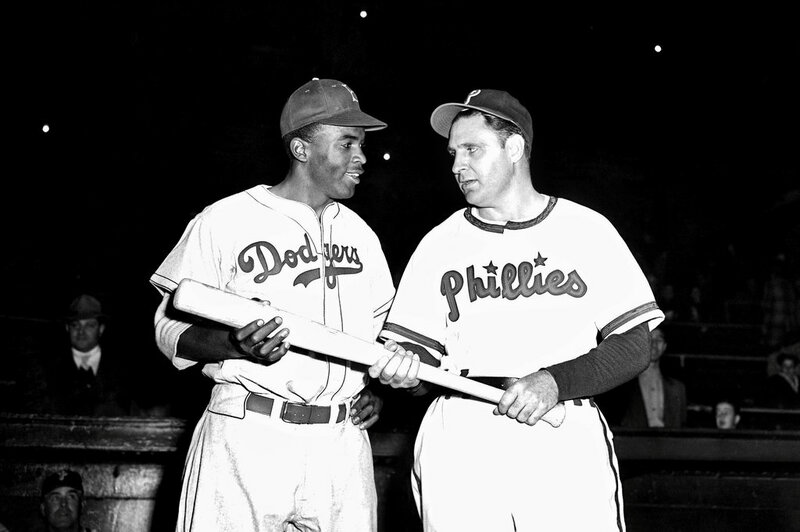 Also, the first game of the series, May 13, is marked as the occasion of the now-legendary story of Pee Wee Reese putting his arm around Jackie while on the field in solidarity against heckling from the stands, confirmed by both Robinson and Reese themselves, athough some investigating has put the event in 1948 (if it happened at all). It should be noted that despite the threats, during this trip Cincinnati did do Philly one better by actually allowing Robinson to stay in the same hotel with his teammates; although, Jackie was not permitted to use the dining areas, having to eat his meals in his hotel room. In 1947, Eddie Miller, at 30, was a perennial All-Star and considered one of the NL’s best shortstops, primarily because of his stellar defense. Debuting with the Reds as a 19-year-old in 1936, he was then traded to the Yankees, but finding no re-entry to the majors there, was then swapped to the Boston Bees in 1939, where he started his career in earnest, leading all NL shortstops in fielding percentage in 1940 with a respectable .276/14/79 line and making his first All-Star team. 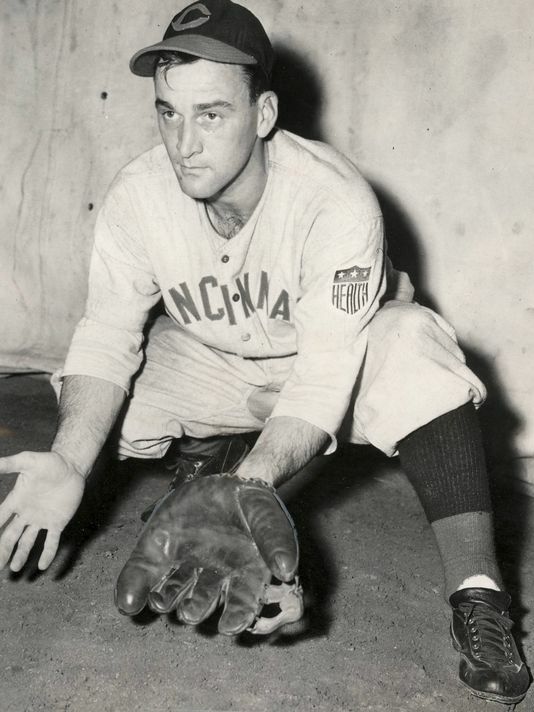 While his average slipped the next two seasons, he continued to top the NL in fielding percentage at his position, again being given All-Star nods every year and even making the starting squad in 1942. Despite his success, amid rumblings of not getting along with Braves’ manager Casey Stengel, he was traded back to the Reds (first of his photos above), bringing along his good glove, continuing to lead or be among the NL league leaders in fielding at SS and making the All-Star team three more times as a Red going into 1947. Pinelli found himself involved in many historic contests – he umpired at the very first night game at Crosley Field in 1935, and also at the first night game at Forbes Field in Pittsburgh in 1940, and was also on the field during Game 4 of the 1941 World Series, at Ebbets Field, when Mickey Owen dropped a third strike, failing to secure the final out of the game and allowing the Yankees to stage a late rally to win the contest and eventually the series. But perhaps the most historic game he was involved in happened to be Jackie Robinson’s first – he was the home plate umpire at Ebbets Field on April 15, 1947, when Jackie strode to the plate as a major leaguer for the first time. And so, a month later, the three converged in a mid-week early season contest in Cincinnati, with a mere 6,688 on hand. The Reds wouldn’t score in that 2nd inning, but would tally a second run in the 4th, and that was more than Cincinnati’s Ewell Blackwell needed as the Reds shut out the Dodgers, 2-0. Jackie would go 2-4 in the losing effort. Ironically, Jackie would himself get picked off in the 6th inning by Blackwell, but the pitcher threw it away, allowing Robinson to scamper safely to second. The Dodgers’ loss dropped them to 2 games behind the Cubs in the early season, while the Reds were still under .500 in the early going. 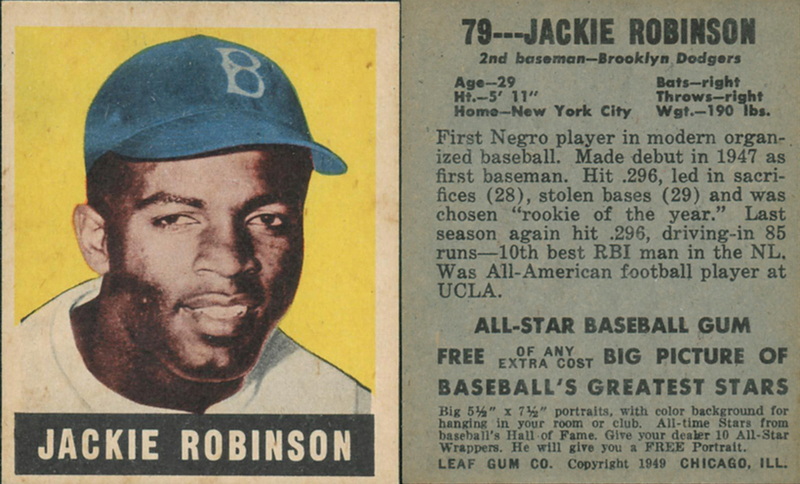 As for the rest of 1947, Jackie Robinson would win Rookie of the Year honors (only one award for the entire major leagues at that time), batting .297 while leading the majors in sacrifice hits (28) and the NL in stolen bases (29), as the Dodgers won the NL pennant by 5 games. His career and accomplishments overall speak for themselves, but highlights include winning both the batting title (.342) and NL MVP in 1949 while also leading the majors in stolen bases (37), and making the All-Star team 6 times in his career. Eddie Miller would enjoy his final All-Star season in 1947, leading the NL with 38 doubles, although, despite a career spanning the 1930’s-1950’s, Eddie would never see postseason play. After more comments made public about his dissatisfaction with yet another manager, he was traded to the Phillies in 1948, but his production quickly waned, and he retired after a short stint with the Cardinals in 1950. 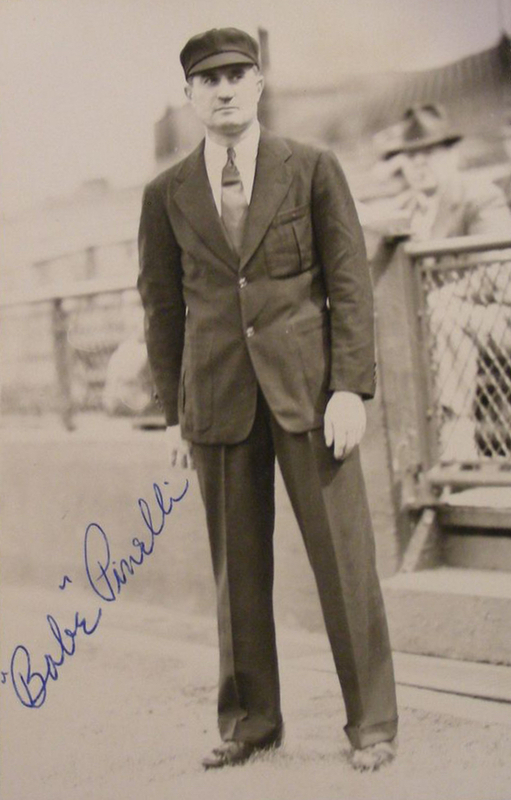 Babe Pinelli continued his storied umpiring career through the 1950’s – he would umpire in 4 All-Star games and officiate in 6 World Series, being crew chief in his final two, but it was probably his last game behind home plate in his career that was most memorable; he called the balls and strikes for Don Larsen’s perfect game in the 1956 Fall Classic. Baseball history fans can recall Pinelli thrusting his arm straight up in the air to call the final strike as Yogi Berra then leapt into Larsen’s arms, and into the history books. As Pinelli later recalled he burst into tears in the locker room afterward, considering the game “my greatest thrill in 40 years of baseball”. Pinelli umpired the rest of the 1956 Series (although not behind the plate) and called it a career. 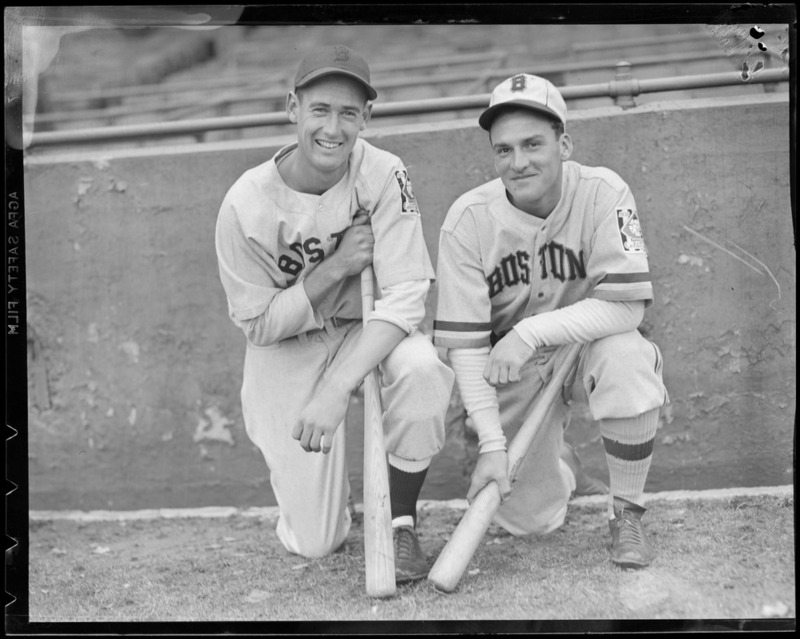 But back in May 1947 in Crosley Field, less was thought of careers that were beginning, careers that were close to ending, or the historic importance of any of it (a miracle of a perfect World Series game? African-Americans both assimilating and thriving in major league baseball to change the course of history? ), but just getting the play right, the catch and tag right, the call right. In the long and varied tapestry of the history of baseball, just another fleeting Moment in Time. Jackie Robinson was the greatest competitor I ever saw. And, beyond just his stolen base numbers, his crazy antics on the base paths disrupted the composure of more than a few pitchers! He saved the Dodger season (up to that point) in the final regular season game with the Phillies, in 1951. In the bottom of the 13th, Jackie dove to his right in short center field, making a spectacular catch of an Eddie Waitkus bloop that would have won the game and eliminated Brooklyn before the famous playoff series. Then he hit the game winning homer in the top of the 14th inning–much to the dismay of all Giant fans!! By the way, Robinson’s batting averages in ’47 and ’48, carried out to the fourth decimal point, were .2966 and .2961. How consistent can you get? Great post! And yes, Jackie’s heroics at Shibe Park in Game 154 in 1951 is definitely one for the books that many have forgotten. And lest we forget that consistency you mention in ‘47 and ‘48 was under great duress. He’s definitely a favorite of this blog for sure. Great post Bill. Wish we could go back in time for one day to see Jackie play in game 154 in ‘ 51! You’re the best Tom! Love this stuff! Would love to meet you someday.